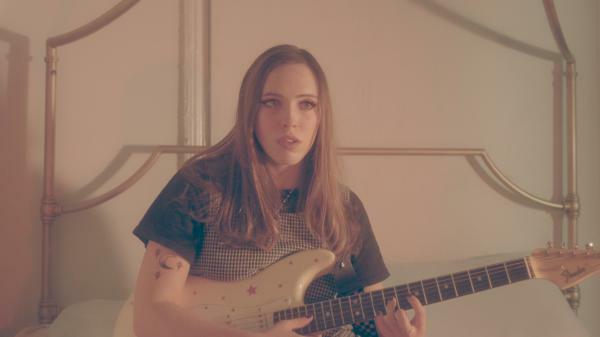 "It's relatable to any girl who's moved away from home and had to start a new life somewhere," Soccer Mommy's Sophie Allison says of Dixie Chicks' "Wide Open Spaces." Years before Taylor Swift's ascent, the Dixie Chicks were the turn of the century's country crossover success story. With origins in bluegrass, Wide Open Spaces, the Chicks' fourth album overall, its first for a major label and first to feature vocalist Natalie Maines, was a breakthrough. In the 20 years since its release, it's sold over 12 million copies, cementing its status as a modern classic. There's a sense of yearning throughout the Dixie Chicks' discography: From the expansive sense of expedition of "Wide Open Spaces" to the unwillingness to settle articulated in "Ready to Run," the Texas trio often presented subtly subversive ideas of independence and autonomy. On her studio debut, Clean, singer-songwriter-guitarist Soccer Mommy – aka Sophie Allison – taps into similar thematic terrain, from the acrimonious admonishments of "Your Dog" to the clarity and control of "Wildflowers." Allison, who grew up in Nashville, has spoken about listening to Taylor Swift growing up, so it makes sense that the Texas trio, too, served as something of an inspiration. "I'm a huge Dixie Chicks fan," she says. "I think 'Wide Open Spaces' is one of those perfect '90s alt-country songs. Plus it's relatable to any girl who's moved away from home and had to start a new life somewhere." In Allison's take on the Chicks' 1998 single, the opening fiddle riffs and vocal harmonizing in the chorus become guitar lines. After the final chorus, Allison explores sonic expanses with jagged guitars and drums. With the tempo slowed slightly, the track is transformed into something more reflective, retaining the excitement but also revealing the anxiety that often comes with starting something new. Even in Allison's introspective interpretation, the emotional core remains the same. The narrative of "Wide Open Spaces" recounts a rite of passage: departing one's home in search of the unknown. In its most poignant moment, a father hollers prudent advice, and an emotional mother grieves as she reflects her own journey. For the young protagonist at the song's center, there's a sense self-awareness that comes with staking one's own space: "She knows the highest stakes." "Wide Open Spaces" is available now on Amazon Music.